Unlike a one-time token approach, the security key does not rely on mobile phones (so no batteries needed), but the downside is that it doesn’t work for mobile-only users because it requires a USB port. Also, the security key doesn’t work for Google properties on anything other than Chrome. The move comes a day after Apple launched its Apple Pay platform, a wireless payment system that takes advantage of the near-field communication (NFC) technology built into the new iPhone 6, which allows users to pay for stuff at participating merchants merely by tapping the phone on the store’s payment terminal. I find it remarkable that Google, Apple and other major tech companies continue to offer more secure and robust authentication options than are currently available to consumers by their financial institutions. I, for one, will be glad to see Apple, Google or any other legitimate player give the entire mag-stripe based payment infrastructure a run for its money. They could hardly do worse. Soon enough, government Web sites may also offer consumers more authentication options than many financial sites. An Executive Order announced last Friday by The White House requires the National Security Council Staff, the Office of Science and Technology Policy and the Office of Management and Budget (OMB) to submit a plan to ensure that all agencies making personal data accessible to citizens through digital applications implement multiple layers of identity assurance, including multi-factor authentication. Verizon Enterprise has a good post with additional details of this announcement. This entry was posted on Wednesday, October 22nd, 2014 at 8:13 am	and is filed under Security Tools. You can follow any comments to this entry through the RSS 2.0 feed. Both comments and pings are currently closed. 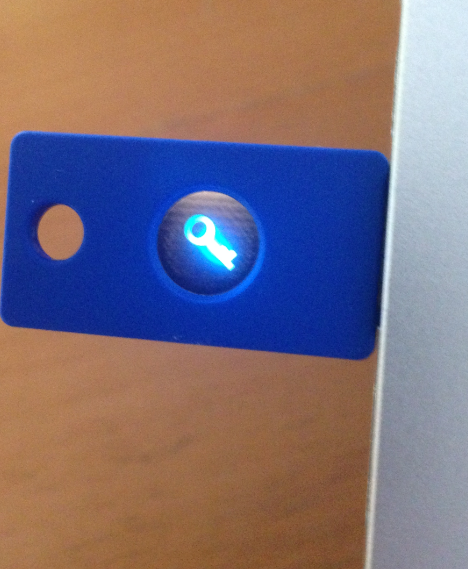 I’ve had a Yubikey for about 6 years now. It’s very secure, and I have never run into a problem using it- even in situations where USBStore is locked down by GPO. Sure, I haven’t used it on high-security systems (because they typically have no USB ports, or the USB ports are epoxy-potted to guard against use), but it’s working very well for my uses. It’s also been dropped, walked on, driven over, underwater, washed, etc, and has no issues at all. I think Wired had a few articles about it not too long ago. And Bruce Schneier also had a few words to say about it. Thank you for this article. I have been looking for a 2 factor encryption method for some time now and this really helped. I am just starting up my blog and website, so it isn’t completely ready yet. I could not get my Yubikey to work correctly in my Gmail account. Is it possible to use the Yubikey for two different online websites? Our school district wishes to pilot GAFE, Google Apps for Education. Any thoughts on safeguards for our teens participating? I found this article in Ed Weekly detailing a law suit earlier this year. The issue was that Google was freely mining the data to build profiles. I don’t know what if anything can be done to prevent that. I have the option to opt out and refuse to let my kid participate.